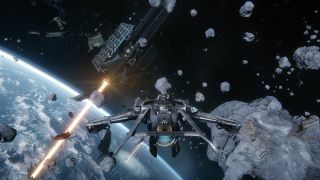 Cloud Imperium Games rolled out the Star Citizen Alpha 2.0 gameplay trailer during The Game Awards last night, and it certainly looks impressive by just about any reasonable measure. It's got spaceflight, it's got first-person shooting, it's got EVA—that's extravehicular activity, which is a fancy way of saying spacewalking—and, at the very end, it promises that "the first-person universe is just getting started," and invites one and all to try the new alpha release now. Like, right now. That promissory bit of text at the very end of the video has resulted in a certain amount of confusion and, yes, anger among backers, because Star Citizen Alpha 2.0 is actually not playable at the moment unless you happen to be one of the 110,000 Citizens who have access to it on the public test server. Developer Ben Lesnick explained the mistake on the Roberts Space Industries forums, where he said that the studio had to give the trailer to the Game Awards people "a while ago" to get in on the show, and that at the time, the new Alpha release was expected to be open to the public today. "Unfortunately, as folks testing and observing know, we were hit with a slowdown bug that seemed to come out of nowhere. (For those not following the testing chatter, that’s why you haven’t see a PTU build in the last two days. )," he wrote. "Knowing what we do now, we would have liked to have changed the exact wording on the trailer. Unfortunately, it was locked in well before the event." The plan is to get it live for everyone as soon as that slowdown bug has been fixed, but for now the game is not actually available outside the test environment. The responses on the RSI forums seem understanding enough for the most part, but there's a little less patience on display on Reddit, although the upset is alleviated somewhat by the fact that the delay will (or at least should) be relatively brief. We'll keep our eyes on things and let you know when the doors swing open.